360° rotation and current/signal transmission are necessary in many of our Hi-tech military equipment, and that is where the slip rings come into play. And as proved by the fact, the slip rings are getting more and more important in the military market. 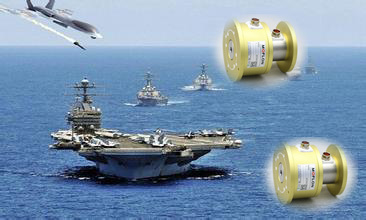 The strict quality standards for military equipment demand the slip rings to be stable, durable and maintenance free; and for some application fields, more detailed standards are needed: high protection, high temperature and high voltage endurable, anti-shock, anti-vibration, low electrical noise and transmission loss, isolation over 60db and so on. US, A powerful country is not only measured by the development of economic and science, but the process of its military modernization. In military field, the strength of our country is becoming stronger and stronger, and much military equipment embodies the level of high-tech. There has a series of specific standards for the technology level and durability of military equipment, and for that reason the State Department, China Aeronautical Center and Chinese Academy of Science all set strict and detailed requirements for the procurement of military equipments. A country, only with the strong military equipment, can ensure the development of economic and science. These standards and requirements will for sure bring the industrial technology to a new level, and enable China industrial technologies gain a worldwide fame. There is a trend of automation in military equipment and the automatic military robot would be employed in the battlefield in the near future. The variety of signal type and current/power and the strict standard of zero-interference and complexity of slip ring installation in military application set a very high level for the qualification of slip ring supplier. Thus, selecting a qualified supplier has become top priority for the customers of military background.? MOFLON has been fully accepted as a qualified slip ring supplier through a long-term cooperation with military industries. MOFLON Focused on slip rings & rotary joints manufacturing for more than 10 years, Our slip rings &rotary joints having been successfully performing in commercial and industrial applications for over 10 years,performing in aerospace and military applications for over 5 years.